In NOTHING PERSONAL, players use their mob family's influence to control various gangsters in positions of power. Players compete to have the most influence on the different gangsters, and use those gangsters to increase their respect. In each turn of the game, players will play influence cards to fight for control of the gangsters. Gangsters provide respect to the controlling player as well as amounts of money - which can be used to further a family's goals. Gangsters also have a variety of special abilities that can be used, including "whacking" other gangsters and making moves on other gangster positions. Players must be careful, though, as active gangsters can attract the attention of the Feds, and it's easy for a gangster to end up in prison - or dead. After five rounds, the player whose family has gathered the most respect is the winner of the game! 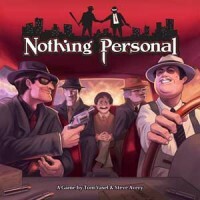 NOTHING PERSONAL is a game that allows players to make and break deals with others - a negotiation and backstabbing game. It is most certainly not a cooperative game! Nothing Personal has been on my radar for a while, I mean a gangster game chock full of double crosses, whaking’s, and family infighting who wouldn’t want to play that? Who hasn’t watched the Godfather Movies or Goodfellas and not wanted to dip their gaming toe in those turbulent waters, who doesn’t want to smile across the board at you buddy and then put two in the back of their head when they weren’t looking and then go get cannoli. Unfortunately like a Staten island immigrant it didn’t look to be reaching these shores. But wait! Having made an offer to the missus she couldn’t refuse this found its way into my Christmas stocking. So lets go take look. So Nothing Personal is a mafia themed take on Kremlin (published back in 1986, but recently resurrected via a Kickstarter in 2013) with a garnish of Cosmic Encounter. Co-designed by Tom Vasel, that jovial gent who hosts The Dice Tower probably the biggest board game review site on the planet, with that pedigree behind it I expected something a bit special. And before we get much further into this I will come clean and state I love this game! Its so much fun, it’s not for everyone and I will lay out why below. So the set up is this, you control one of the mobs five family’s and are battling it out with the others to gain control over the business and accrue the most respect whilst doing it. You do this by stacking influence chips on the motley crew of hitmen and enforcers arranged on the board, whoever has the most chips gets to control that gangster and in turn reap whatever respect and cash they accrue, additionally you can utilize whatever power their position in the pecking order gives or any special skills they may have. Before I dive any further into how this plays I have to give a shout-out for the fantastic component quality of this game, the box weighs a ton and its no wonder, its bulging with fistfuls of thick components, tuck boxes and other assorted goodies, all the influence chips and money are chunky slabs of board, you get some real coin tokens and even a metal Capo ring to wear when you are the Godfather. All of the artwork and design is top notch, with each of the Gangsters getting really nicely illustrated cards (if you follow the dice tower you may well recognize some of the faces on these) and the whole package just oozes quality like a recently plugged bad guy. Right that’s the fawning out of the way, but really, ****! this is a ruggedly handsome game. The game-play is pretty straightforward and I’ve had no problems teaching this to my group and within a turn everyone I’ve played gets it. The game plays out over five turns each broken down into six stages like so. The Commission – This is where everyone squabbles over which gangster they want and plays cards to effect the influence the various family’s exert over them. This is the meat of the game. The Crew – You work out who has control over who and you get paid out with cash and respect, and then working up through the organisation everyone gets to do that position or gangsters action. The Fence – You get more cards. Or can buy them. The Feds – Its a raid and someones getting pinched. Anyone’s mobster who has amassed too much influence is going to do time. The Family – Any mobsters left standing that haven’t been taken out or are in the slammer shuffle up through the ranks. There’s always somebody waiting in the wings to step over your dead body. Bookkeeping – And we go back up to the top and start all over again. As an example the other night we started a game and the first turn in I offered my brother in law a perk that one of my gangsters had in exchange for cash, he dutifully paid up and then I took his money and gave the goodies to someone else. And you can do that, this game will be responsible for game night grudges that will endure for years. That set the feeling for the rest of the night and our two family’s slugged it out for the duration of the evening, and following me whaking a good number of his wiseguys and other morally dubious behavior I positioned myself as top dog, at which point it was too late to usurp me. Just when i was out… they pull me back in! So two caveats, the first is this isn’t going to be for everyone, if your group are not going to embrace the more anarchistic possibility’s and get down and dirty they’re probably still enjoy the game, but you will wonder what all the fuss was about. And on the opposite side of the coin, make sure everybody understands that skulduggery is a huge part of this, because this is rage quit in a box, there will be tears. Aside from gaining influence on you gangsters and scoring the respect that will see you win (you even get a little gangster meepsters to track your progress) you can play influence cards. These come in all sorts of flavors that include simply adding extra influence onto the board or some really fun ones that involve whacking other positions or blackmailing. And after a round of these have been played you can ante on the next cards forcing your opponents to pay to play, anyone cash strapped are not going to thank you and you can chalk up some new grudges. This has such a neat and simple design, but combined with the option to break the game by negotiating, lying or just cheating the others heck maybe team up. All of these little opportunities are there, its basically saying well here’s your game now go make some of your own rules up. During the commission stage, you could just quietly pop out your influence chips happy in your own little world, but what about if you offered another player a card for cash, or proposed a move and see who would bite. It suddenly ups the stakes and draws everyone into whats happening. Then with the crew stage when the rewards start to come in and you suddenly see the repercussions of allowing somebody to control a gangster who then uses that power against you, ah its good stuff. Tired of that mobster ahead of you in the pecking order getting all the respect and cash, well than whack him or if you can’t bribe somebody else into doing it. You get a cool die for that task but be warned somebody else can pay $10 to make you re-roll any result. Not feeling that violent then make a move, you can muscle your mobsters up the tree to get those juicy higher tier positions in the family. And that’s something I’ve seen in subsequent plays, the first time out our happy family of miscreants remained mostly in place for a big chunk of the game. That all changed on the next plays with arrests and whackings and backstabbing aplenty and by the end of the second round we had amassed quite a few casualties. I love this game, I’ve always had a soft spot for mob movies and this game embraces this theme so beautifully and simply, and it does what all good board games do, entertain you and give you stories to recount later. Even now as I write this, i’m thinking up all manner of great tactics for when I next get this to the table. So if your group love the genre or have thick enough skins to stomach the meanness that this brings out in you then its a no brainer, go and get it already. Add a Review for "Nothing Personal"